Since 1973, the number of unemployment benefits has dropped significantly. It has been reported that as of December 2017, 1.87 million Americans receive benefits. It can also be noted that the Department of Labor received its largest number of newer filings from those that survived the destructive hurricane season. This caused massive damages to businesses in southern states and Puerto Rico. Despite this, the number of new applicants was low. The US Bureau of Labor Statistics suggested that the economy added 148,000 jobs in December and hence the unemployment rate remains at 4.1 percent. This comes at a time when companies were out to do the other better by offering raises, bonuses and increasing the minimum wage after the passage of President Donald Trump’s tax reform bill. This helped more than a 100 American companies to provide their employees with bonuses after Trump signed the Tax Cuts and Jobs Act. Large corporations like AT&T, Nationwide and Comcast have increased their 401(k) matching rate, increased domestic investment and raised their minimum wages. Another major player that joined this list was Walmart which gave its 2.1 million employees a one-time bonus, higher wages, and other new benefits. Even after the US economy rebounded from the hurricanes, it had added 261,000 jobs and this is by far the best performance by the government. Unemployment had continued its decline to 4.1% since December 2000. But more importantly, wages have not increased as much and only grew 2.4% in October as compared to the previous year. This was also well behind its September numbers a year ago. One of the biggest mysteries in this economy is the absence of better wage growth and inflation. US has otherwise added jobs for 85 straight months and is the longest streak on record. Initially, the government suggested that there would be a loss of 33,000 jobs in September to the economy based on Hurricanes Harvey and Irma. But on the other hand, the revised figures show a gain of 18,000. Job gains for October have happened across all sectors. As soon as the storm had passed, restaurants had reopened and added more than 89,000 jobs after losing out on the same in September. Businesses services gained 50,000 positions while healthcare firms hired 22,000 employees. One of the most positive industries was manufacturing that gained 24,000 positions since October. Since the presidential election a year ago, it had gained nearly 156,000 jobs. This was attributed to the fact that they renewed the strength of the global economy and a weak US dollar that made American exports more affordable to foreigners. Manufacturing firms had heavily relied on shipping and selling overseas. Other interesting and notable figures in the report stated that 700,000 Americans left the labor market in October. Though the Labor Department could not provide a reason, the only conclusive answer was that Baby Boomers were retiring. The unemployment rate dropped due to a shrinking labor force and not become of more hiring. Industries that registered minor job losses like mining lost 2000 workers and retail stores lost 8000 jobs. Apart from this, the overall picture looked favorable and this meant that at this point the financial crisis has not been easy on workers. You should know that US unemployment claims have fallen to 222,000. This is the lowest its been in 44 Years. This is because US unemployment claims fall by 22,000 to 222,000 and this has been recorded the lowest since March 1973. 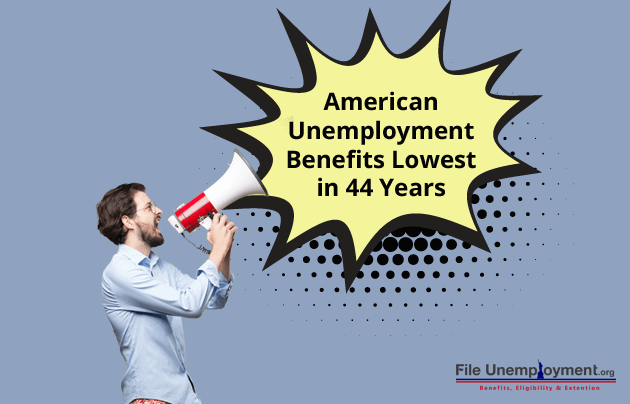 In terms of relating to these numbers, Americans collecting unemployment benefits fell to the lowest level since President Nixon was held office. Also, the less volatile four=week average slid by 9,500 to 248,250 which is lowest since late August. This means that the overall number of Americans that collected unemployment checks dropped to just 1.89 million. This is the lowest it has been since 1973 and down nearly 9 percent from a year ago. Unemployment claims are usually associated with layoffs. The low levels help you notice that employers are confident about their economy and positive about hanging onto their workers. Employers cut 33,000 jobs in September and this was the first monthly drop in seven years pushed the 16 years low to 4.2 percent. This was mainly caused due to the hurricanes – Harvey and Irma that caused chaos and destruction to Texas, Florida, Puerto Rico and the Virgin Islands. A few days ago, President Trump mentioned that a year after his inauguration, women unemployment was the lowest in 18 years. Figures state that the joblessness among women was 3.7 percent in December and was well below the overall US unemployment rate of 4.1 percent. This a reason for employers to look into more employment opportunities for women and ensure that their workforce has a sense of job security and fulfillment. You can see that unemployment was at 4.8% in January of 2017 and declined to 4.1% at the end of the year.In December, the unemployment rate was 4.1 percent for the third consecutive month. On average the unemployed persons were at 6.6 million and mostly unchanged over the month. Over the period of 2017, the unemployment rate and the number of unemployed persons were down to 0.6 percentage points and in terms of figures, 926,000. The rates for unemployment were for adult men (3.8 percent), adult women (3.7 percent), Whites (3.7 percent), Blacks (6.8 percent), Asians (2.5 percent), and Hispanics (4.9 percent) showed little or no change. The labor force participation rate, at 62.7 percent, was unchanged over the month and over the year. Also, the employment to population ratio remained unchanged at 60.1 percent in December but was up 0.3 percent over the last year. If you are unemployed and looking to claim benefits, then you should use the Benefits Calculator to figure out the benefits that you are eligible for. Using the Benefits Calculator, you should fill in wages earned for four months and select the state that you reside in. Do read about qualifying wages, the duration of receiving benefits and the amount of weekly benefit located in the section below the calculator for further clarity. Share your thoughts and views on unemployment in America and if you have further clarification, you can give us further details.